The trial of suspects in the murder of women in Entebbe and Wakiso districts has failed to kick off. The nine suspects, including prominent Entebbe businessman Ivan Katongole turned up at Entebbe Chief Magistrate’s court Monday morning for further mention of their case. However, the trial magistrate Mary Kaitesi was nowhere in sight. They were then paraded before Grade One magistrate Mastula Mulondo who remanded them to Kigo prison. Katongole together with Hellen Nabaggala and Andrew Kizito are charged with the murder of Rose Nakimuli, who was the sixth woman to be murdered in the recent spate of killings that have claimed the lives of now 23 women in Entebbe and Wakiso districts. The other suspects Godfrey Mayanja, John Bwanika, Jonathan Kibirango, Richard Kasozi, Muhammad Sangayo and Yiga Balijerwa were produced before court and charged with the murder of Sarah Nakajjo, whose body was discovered on August 11 in Nkumba Bufulu. However, despite being behind bars, this hasn’t stopped the killing of women. Three more women were found dead in Entebbe last week, a time when the group was already in jail. Meanwhile, police has this morning been involved in running battles with residents of Kitooro, in Entebbe Municipality who were demonstrating against the continued killing of women in the nearby Katabi Town Council. 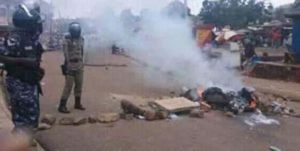 Four people including Aloyo Daisy Lugonjo, a councillor and Speaker of Division B Entebbe Municipality and three men were arrested during the demonstrations.